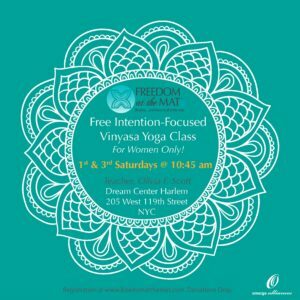 Freedom At The Mat is a yoga & intention-setting class exclusively for women to commune and transform their lives through mindful breathing, movement and community. Classes are held on 1st & 3rd Saturdays at 10:45 am at The Dream Center! 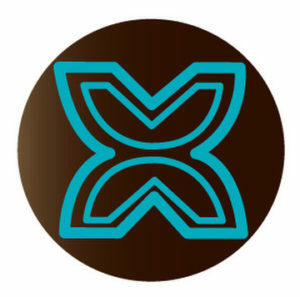 The Fawodhodie (Adinkra) symbol = freedom & independence. life is filled with encumbrances and distractions that threaten our connection with our authentic, core self. without this connection, our daily decisions and actions aren’t rooted in a place of certainty or cause. 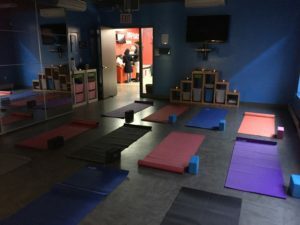 freedom at the mat yoga is a sacred moment in which women gather to put themselves first, by honoring themselves physically through movement, spiritually and amongst the community. our emphasis is on being free from anxiety, drama, depression and issues. and focusing on listening to the divine within. designed to connect mind, body & soul, our classes begin with prayer and intention setting, followed by a 45 minute vinyasa yoga class. we pray to God without a specific deity being represented. classes are set to a slow to mid-tempo and are suitable for beginners and intermediate level yogis! Native Memphian. Harlem resident. Passion about health & wellness and God. Over the years, I’ve witnessed the impact of exercise psychosomatically on myself and loved ones. Yoga was an amazing healing agent during a difficult time in my life, and now is a a part of my lifestyle. My faith in God is the foundation of my life. So in my classes, I integrate faith & prayer to God into our yoga-inspired classes. I invite all to join me in the Freedom At The Mat community to reset intentions and live the full lives we were intended to live. When not practicing yoga, I’m leading Omerge Alliances, a marketing management agency, reading a book or on a quest for new beauty products! Click to sign up now for the next class at The Dream Center Harlem!! 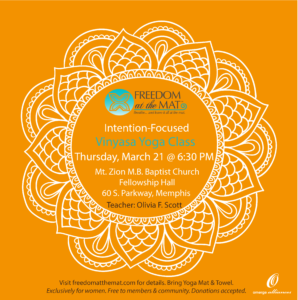 MEMPHIS POP-IN CLASS – Thursday, March 21! We are thrilled to have a special Pop-In Class in our hometown, Memphis, TN, on Thursday, March 21 at 6:30 pm. Please sign up for this class here. Click to sign up now for this Memphis Pop-In Class!! we are honored to be hosted by The Dream Center Harlem, which was created to be a place where people could come to realize their dreams. 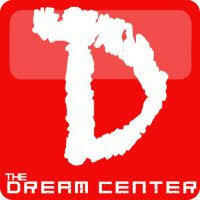 The Dream Center Harlem is located at 205 West 119th Street (the right side) in Harlem, NYC. This yoga experience is like no other. Olivia is welcoming and her spirit is full of light. She encourages gracefully and provides a safe space to be who you are. I loved how the music and the postures were complementary to the theme of each class. Most of all, the connections I made with the other women in the class were priceless. 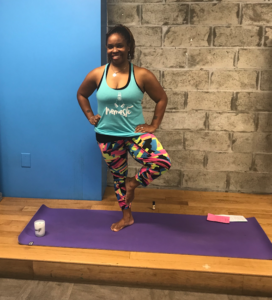 Olivia has taken a very individual practice like yoga and has re-created it in such a beautiful way so as to feel a deeper sense of connection to yourself and one another. I highly recommend Freedom at the Mat, with Olivia Scott. You will sweat, laugh and love how you feel inside and out. I started attending “Freedom at the Mat” during the spring session of 2018. The first time I registered, I was home with the flu, but I decided to go anyway because it was so close to my house. I’m so glad I did. Halfway through the class, I noticed a change. My nose cleared up, my headache went away, and my body aches subsided. I was amazed. I also felt mental clarity. The sister circle was healing. I’m not a person that prays, but the prayer felt organic and comforting; not forced. Olivia’s classes give you a mind and body experience and I recommend it to anyone; novice or veteran.